"Strauss's Oboe Concerto found an ideal interpreter tonight. 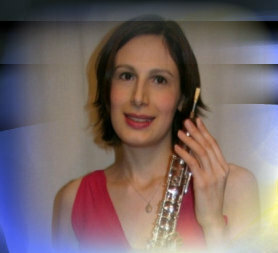 Julia White is an alumnus of Morley College and after several years playing with the Santiago Philharmonic she has returned to her home shores to continue her career. This was a most assured performance, full of warm lyricism and dazzling virtuosity. From the outset the music floated on air, both White and Peebles understanding that this is not a serious piece but an 18th century divertissement, meant to be enjoyed and not pondered over. White was clearly audible throughout – not always easy in the big acoustic of St John's – and with a discreet accompaniment from Peebles and his orchestra – the wind band was especially good – this made for a fine performance." "...Ravel's Pavane pour une Infante Defunte...during which the beautiful tone of oboist Julia White was shown to especially lovely effect"
"a technically assured and musically feisty performance of Poulenc's Sextet"
"The trio went on to win the hearts and minds of the audience with their mind-blowing performances (both in group and solo performances)." "...wonderfully spirited and musical performances..."
"This CD is exciting and inspirational. It provides an invaluable asset for the young oboist, and I will continue to use it in my lessons and recommend it to both teachers and their pupils.."